If you’re running a class then it’s hard to find a better registration service than Event Espresso. It’s simple to set up and once you’re going it takes care of all of the work for you. That means less time on boring admin, and more time spent doing the things that you love! This tutorial will show you how to set up a one-off class. 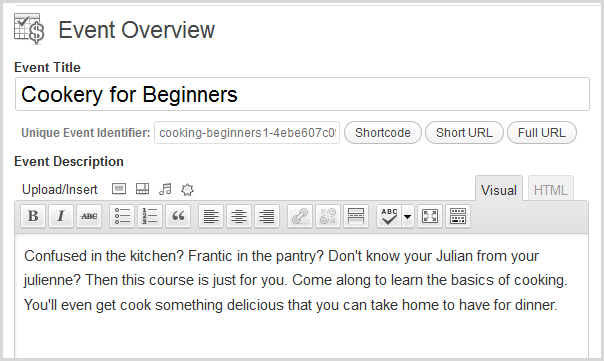 I’m going set up Event Espresso to run a class called “Cookery for Beginners.” However, you can follow the steps and replace with your own class’ details. You can read the installation and setup instructions to help you get started with Event Espresso. Once you’re set up we’re ready to go. Before we actually create the event, we need to set up some options to make everything run smoothly. 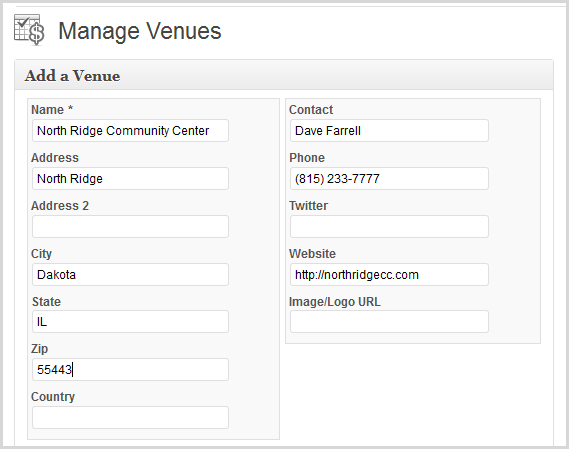 Navigate to Event Espresso > Venue Manager. I’m going to set this up to take payments via PayPal but you can use any gateway that you wish. Click on “Activate PayPal IPN”. Now you can fill in your PayPal details. You should also choose the correct currency for your account. 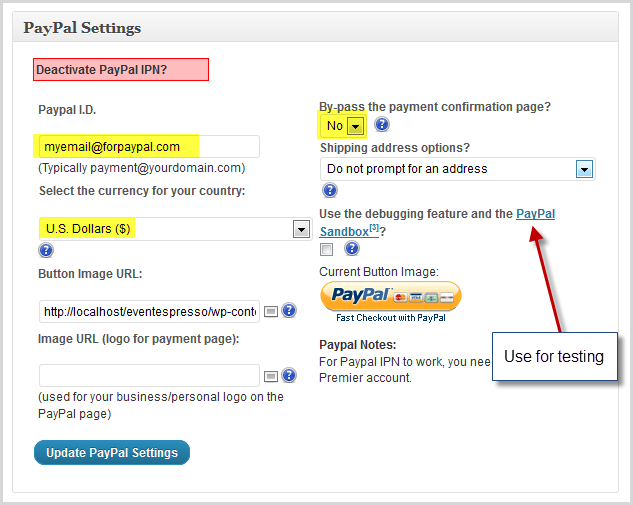 If you want to test your setup you can check the PayPal sandbox settings. This will let you run through your signup process without having to actually pay for anything. Does the attendee have any food allergies or dietary requirements? Does the attendee require any assistance or special access? We need to create these questions. Then we can group them together and attach a whole group to an event. Complete the form. 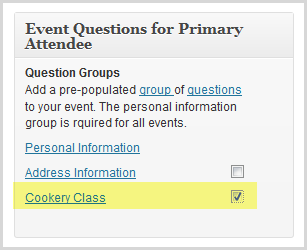 You can choose different types of form fields for your attendees to fill in. You could use a dropdown for a multiple choice question, or a check box for a question that just requires a yes/no answer. 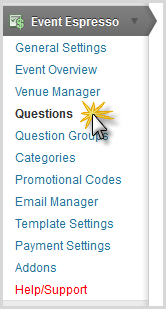 You can also make a question required so that the attendee is forced to answer it. These groups will capture the essential information that you need but you can create specialised groups of questions that are tailored to your course. 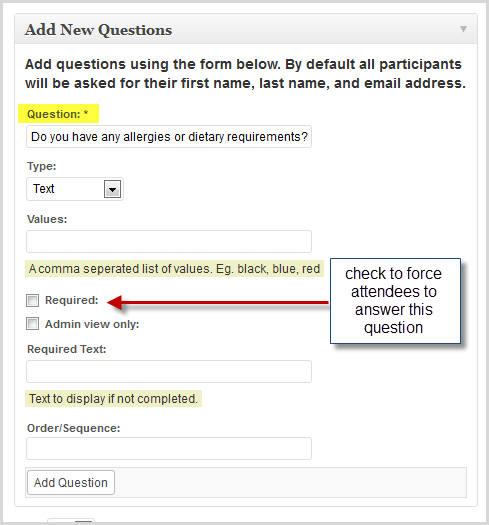 Give your group a name and select the questions that you want to add. You can also decide whether you want the group name and description to appear on the homepage. Now you’re ready to create your event! Navigate to Event Espresso > Event Overview. You’ll see what looks likes the WordPress post and page editing screen, but with lots of extra bits. This is the main event creation page for Event Espresso. It’s where you’ll come back to again and again for all of the amazing events you’ll be creating! 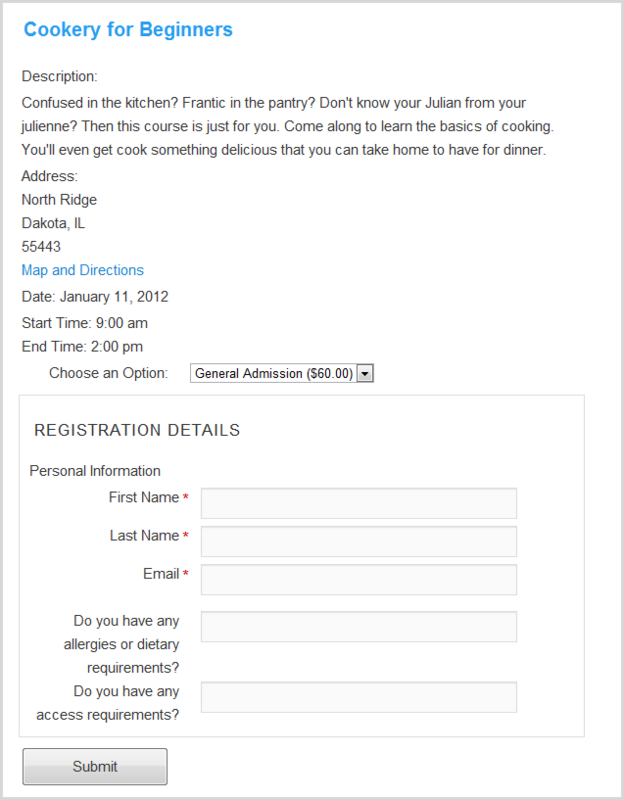 To start with add a name and a description for your event. This will appear on the event page on the front end. Now let’s take a look at the event options. You’ll find this box on the right hand side under the Publish button. Because my cookery class requires a kitchen classroom I need to limit the numbers to 15 so that everyone gets a workspace. Also, I do not want to allow group registrations. Here you can add the practical details of your event. Obviously the most important thing that you need to enter is the date and time. 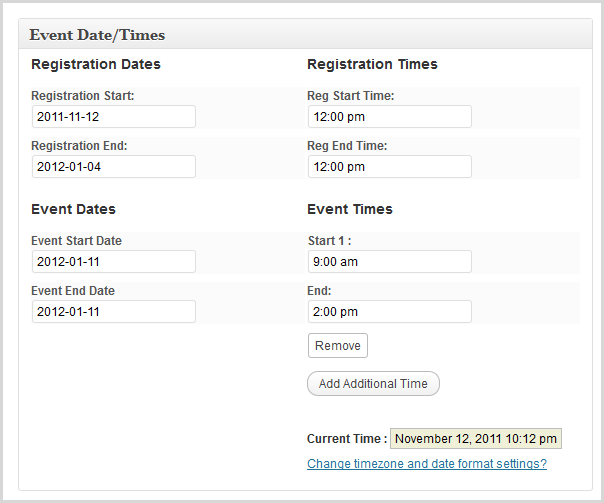 However, you can also set the date and time that registration opens. This helps you control when people can sign up. For my cookery class, for example, I want registration to close a week before the class. This gives me time to buy all of the ingredients! 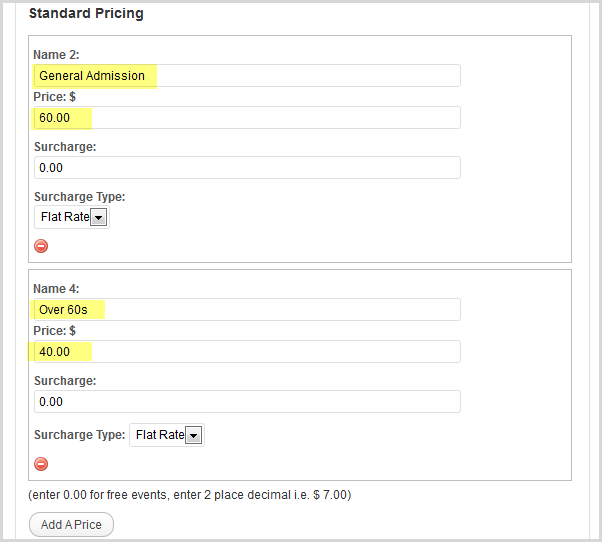 You can add as many different prices to your event as you want. This means you can have special rates for students, retirees, children, just about anyone you want. For my event I want a flat rate of $60, but I’ll also add a rate of $40 for the over 60s. 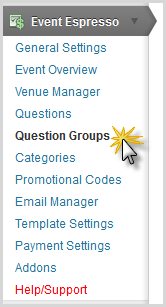 Here’s where you can attach your question groups. Everyone has to fill in their personal information – first name, last name, email address. 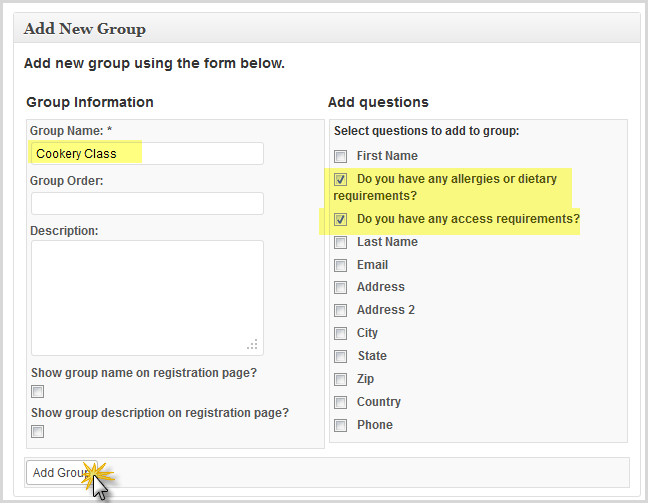 You can add to those groups or create your own groups. I’m going to attach the group we just created. 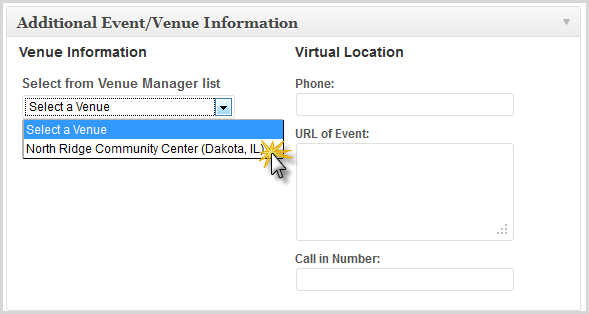 Now you get to select the venue that you’ve already created. Choose it from the dropdown menu. When you’re happy with your settings click “Submit New Event”. Your course is now ready to go! It will appear on your registration page but if you want you can insert a shortcode into a specific page. 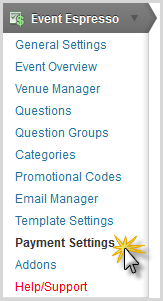 To find the shortcode navigate to Event Espresso > Event Overview. You can copy this shortcode onto any page except your main event registration page.